As the Olympics approach, leaked internal documents and state media reports in China indicate that a military mobilisation is being directed at groups within China which are considered harmless by governments abroad. The Chinese regime has ramped up anti-terrorism measures; at the same time, a government think tank has admitted that the threats from international terrorism groups are “not big”. According to a July 4 report in state media, Li Wei, director of the Anti-terrorism Research Centre at the Institute of Chinese Modern International Relations, cited “forces” in the Western provinces of Tibet and Xinjiang, the Falun Gong meditation group, and pro-democracy organisations as the “main terrorist threats” to the Beijing Olympics. “We can’t neglect the threats from international terrorism forces either, though their threats are not big,” Mr Li adds. In an interview with state media on July 8, Tian Yixiang, Head of Military Work Section of Beijing Olympic Security Co-ordination Group, confirmed the deployment of Infantry, Navy and Air Force, again citing the above groups as the main threats. Mr Tian’s sentiments were echoed by Zhou Yongkang, member of the powerful Politburo Standing Committee and former Minister of Public Security, in an April 16 national telephone conference held with the first person in charge of each province, city, ministry, committee, office and bureau. “Western enemies do not approve of our holding the Olympics, and are interfering with our Party's power,” he told the participants, in a confidential transcript of the conference leaked to The Epoch Times. Zhou accuses the Dalai Lama, a Nobel Peace Prize Laureate, of “attacking the Government using the 49th anniversary of his escape”. He says the Falun Gong meditation practice, whose founder Li Hongzhi is a Nobel Peace Prize short-listed nominee, should be prevented from “doing anything”. “We must create more battlefields and united battle fronts. Each leader must re-educate, replan pre-Olympics stability work, and strictly prevent any incidents from happening,” Zhou says. Another leaked document from the Central Political and Judiciary Affairs Committee outlines a “social safety control system”, which involves mobilising work units, organisations and teams of local residents, and making them personally responsible for security in their area. “All levels should sign letters of responsibility with management objectives, get clear of their responsibilities one by one, study the measures to implement task by task, and assign tasks unit by unit, individual by individual,” says the document, dated February 19. The document also talks of “strengthening the management” of foreign journalists and foreign non-government organisations. The “social safety control system” matches what is happening on the ground, with large numbers of citizen police wearing red armbands now patrolling the Beijing streets. All vehicles entering and leaving the capital undergo a “safety check”, and daily commuters on buses and trains are randomly asked to show their ID. Thousands of new surveillance cameras have been installed throughout the city, and leaflets have been distributed telling residents to report any foreigners or suspicious people to the police. 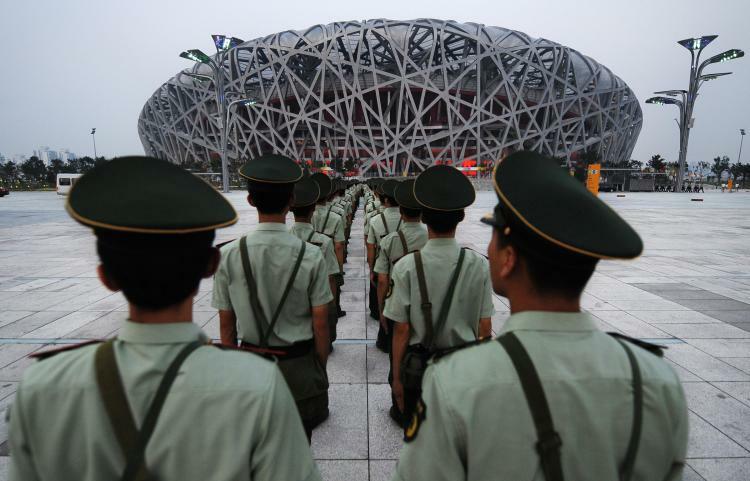 Human rights groups have long accused the Chinese Communist Party of using Olympics security as a convenient excuse to suppress domestic dissent. No groups in the western Chinese provinces of Tibet or Xinjiang are listed by the US State Department as terrorist organisations.. However, Tibet and Xinjiang (also known as East Turkestan) representative groups, along with Falun Gong practitioners and democracy activists actively highlight human rights atrocities committed against them by the Chinese Communist Party. “In the current crackdown what we’ve seen is the Chinese Government targeting peaceful human rights activists, including people who raise human rights concerns in connection with the Olympics,” says Mark Allison, East Asia Researcher for Amnesty International. “[This includes] people like Hu Jia, who has said publicly that human rights are not improving in the run-up to the Olympics and who has tried to document people being detained by the Beijing police, and he is now being detained for inciting subversion.